List Rules Vote up the best battles among the stars. There's something about a good space battle that's just more satisfying than anything else that could be put onscreen. But the best space battles in film and television are more than just spectacle. In order for an action sequence space (or really any action sequence) to work, you need the right amount of character, tactics, and preparation to make sure the drama plays effectively. A space battle can be anything from massive fleets to two ships fighting it out in a submarine-esque engagement. Sometimes you don't need thousands of lives on the line for great drama, but rather two people out to prove something to themselves. Of course, if we're talking something like Star Wars... having thousands of ships throwing themselves at each other really helps. Babylon 5, Battlestar Galactica, Star Wars, Star Trek, and more have given us some of the best interstellar conflicts on the screen, so check out the list below if you want to see these epic battles in outer space firsthand! The brilliance of this battle lies in its desperation. The Rebels' hand is forced by Jyn's daring plan to commit to a raid on an Imperial outpost, so they send in their fleet to take on Imperial forces in the sky while the ground forces try to steal the Death Star plans. What makes the space battle work so well is that there's an objective: the Rebel air unit needs to take down the planetary shield so the Rebel ground unit can transmit their data. Because those two plotlines are working in tandem, they both need to succeed in order for the good guys to make it all worthwhile. Still the fleet-on-fleet battle to beat, the Battle of Endor has aged exceptionally well. With tons of capital ships on both sides and a Death Star looming over the whole thing, the stakes are at their highest. The end run with Lando and Wedge is thrilling and gives a great cap to the end when they're trying to escape a collapsing Death Star. One of the original onscreen space battles that captured the imaginations of audiences everywhere. The idea of tiny fighters doing attack runs on a massive planet-destroying space station is pretty novel and that sets up a great dramatic device. In the end, it just comes down to Luke Skywalker making a one-in-a-million shot with Darth Vader on his tail. Throw in a last-minute save by Han Solo and you have one of the most crowd-pleasing third acts in all of cinema. It may not last long, but the Battle of Coruscant is incredibly impressive while it lasts. 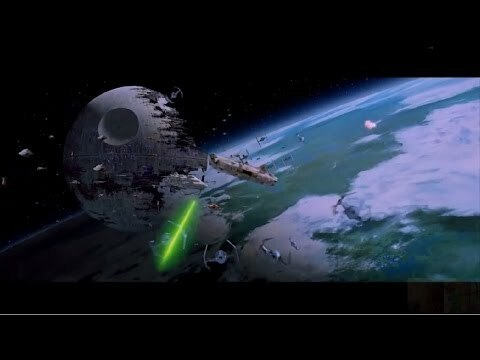 The first one-take shot of Anakin and Obi-Wan's fighters as they round a Star Destroyer into a massive war zone is probably the best opening shot of the saga. It also shows you Anakin and Obi-Wan at the height of their friendship along with Anakin's famous piloting skills.